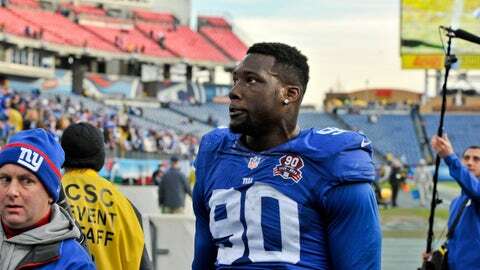 New York Giants defensive end Jason Pierre-Paul has interest from a number of sports apparel companies to develop a special glove for his injured hand. Jason Pierre-Paul lost a significant amount of money when he lost a portion of his hand during an unfortunate 4th of July fireworks accident. Apparently, he’s going to get some of it back in an endorsement deal with one of “several sports apparel companies,” which are bidding for the right to craft a special glove that fits his injured hand, according to Jason Cole of Bleacher Report. This development is great news for Pierre-Paul, who will reportedly meet up with the New York Giants on Tuesday to follow up with the team about a potential return to the field some time in 2015. There have been many different reports about when Pierre-Paul might finally make his return to the field. Bob Glauber of Newsday recently reported the pass-rusher could return for the final month of the season. Likely, Pierre-Paul would prefer to come back much sooner than that, as every game he misses is costing him money. Perhaps a new glove deal will assuage his financial losses as a player on the field. In the meantime, it will be interesting to see what comes of future talks with the Giants. When healthy, Pierre-Paul is one of the top pass-rushers in the league. New York needs all hands on deck during the second half of the season, because the NFC East is wide open and available for the taking.